Rego Park has everything you’d want out of a New York City neighborhood – bustling streets filled with activity, quiet areas to raise a family, and plenty of shopping and food options to keep you busy. The area is named for the Real Good Construction Company, which had a huge hand in developing the neighborhood’s residential zones in the 1920s. Today, Rego Park is home to many young families and professionals who, over the years, have turned this once-sleepy neighborhood into a happening place. Here’s what to do, see and eat around the neighborhood. For almost 80 years, the Rego Park Jewish Center and Synagogue has been a sanctuary for Jewish immigrants. But the landmark center is more than just a space for religious service. Marvel at the Art Deco-style architecture as you walk by it, at 97-30 Queens Blvd. ; stop and stare at the beautiful mosaic by Hungarian artist A. Raymond Katz along the top of the entrance, depicting scenes from the Old Testament. Inside, the stained-glass windows and cathedral-like space will take your breath away. The center is listed on both the New York State and National Register of Historic Places. This iconic, 70-year-old delicatessen at 96-40 Queens Blvd. 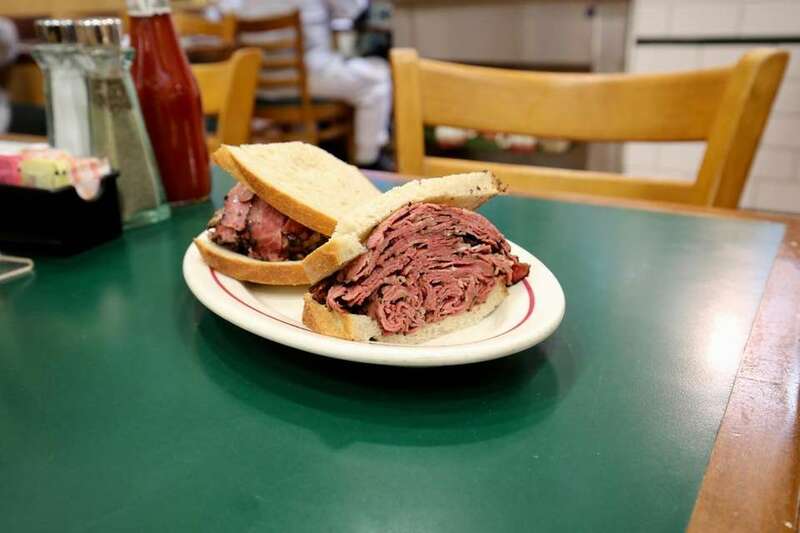 often gets overshadowed by the two massive discount stores that stand on either side of it, but nothing compares to the moist, handmade pastrami and roast beef sandwiches you'll get at Ben's Best Kosher Deli. Six years ago, it was featured on Food Network's "Diners Drive-Ins and Dives," which only boosted business for the already popular establishment. The menu here is almost as extensive as the deli's history, complete with standard sandwiches, salad platters, a kids menu and hearty entrees. There's even a "Diners Drive-Ins and Dives" option, an intimidating combo of pastrami, brisket, steamed hard salami, fried onions, hot peppers, balsamic vinegar, oil, and mayo on club for $30.50, so you can eat like Guy Fieri. Don't forget to bring an antacid. East of 63rd Drive, the Crescents is a suburban gem in a bustling city, named for its semicircular streets that spread out like fan from the Long Island Rail Road's Main Line to Woodhaven Boulevard. Beautiful, Tudor-style homes, and large, manicured lawns line each block, making for a scenic walk. Thinking of moving into this picturesque neighborhood? Think again. A multi-bedroom house in the Crescents can cost you anywhere from $1 million to $2 million. Rego Park has arguably some of the best shopping in Queens, thanks to the colossal shopping complex along the Long Island Expressway that was completed in 2010. Rego Center, 61-35 Junction Blvd., has every store imaginable, including department stores Century 21 and Burlington Coat Factory. Of course, no mall would be complete without a food court. At Rego Center, choose from favorite franchises like Panera Bread and Dallas BBQ. From eveningwear to loungewear, Rego Park is filled with half-price stores for clothing, shoes, accessories at a bargain. It's a mouthful to say, but the food at Cheburechnaya is worth every bite. The speciality at this simple yet elegant Uzbek restaurant, at 92-09 63rd Dr., is the chebureki (pictured) -- large, empanada-like fried pastries stuffed with a soupy curry of savory meats, mushrooms, potatoes or cabbage. You can also choose from a variety of lamb and vegetable kebabs, salads and stews. Somehow there is Middle Eastern fare like hummus and babaganoush on the menu, but it's best to stick to the restaurant's native Uzbek options. Save some room at the end for chak chak, fried noodles covered in honey and walnuts that kind of look like thick, Rice Krispies treats. It's one of the most famous thoroughfares in Queens and it runs right through Rego Park -- so why not see what Queens Boulevard is all about? You can find all kinds of unique restaurants and establishments to pop into, from Uzbek eateries to kosher delis to nightclub lounges and much more. Keep a sharp eye out while you walk, though; Queens Boulevard has a nasty reputation of being called the "Boulevard of Death" because of the many fatal accidents that have occurred along the major roadway since the 1990s. After a long day of walking and eating, it's time to unwind with a drink or two. Tropix Bar and Lounge, 9532 Queens Blvd., is the place in Rego Park for a fun night out with friends, complete with a live DJ, karaoke and a different themed event every night of the week. Happy Hour at Tropix often ends well after 6 p.m.; on Tuesday nights, drinks are half-off until 4 a.m. Order a big plate of "not your ordinary wings" while you drink and choose from 28 different sauces for dipping. If you're with a large group, consider reserving a VIP room upstairs (pictured). It comes with a private bar and a bird's-eye view of the dance floor below. Rego Park has quite a large Jewish population, so many restaurants and cafes stay closed during the day on Saturdays for Shabbat. Cheburechnaya, for example, opens at 7 p.m. on Saturdays. The best way to get to the neighborhood is to take the E, M or R, which all stop at 63rd Drive-Rego Park, dropping you right off on Queens Boulevard. Explore 34 new-to-you neighborhoodsCheck out Bushwick, Morningside Heights, LIC & more neighborhoods. Spend the day in Forest Hills From where locals head for bagels to the spot for satisfying a late-night sweet tooth. Your ultimate guide to SunnysideHop on the 7 train to 46th Street and Queens Boulevard to get started.